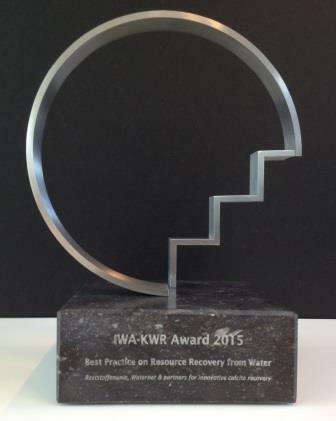 In 2015, chainpartners Reststoffenunie, Waternet, Ardagh Glass and Desso won the prestigious biennial IWA-KWR Award for Best Practice on Resource Recovery from Water for the valorisation and high-value application of calcite pellets. The pellets are released during the drinking water softening process. The chairman of the jury Willy Verstraete presented the award on 31 August during the 1st IWA Resource Recovery in Ghent. 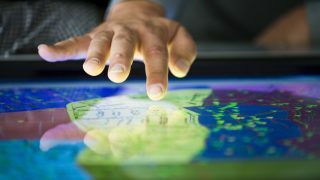 The recovery of resources from water and wastewater is expected to constitute an important alternative to extraction from primary, and thus finite, sources. The resources recovered from the watercycle are water itself, but also energy, nutrients and metals. The winners merited the Best Practices Award because they represent the best example worldwide of the large-scale and economically feasible valorisation and use of resources from the watercycle. 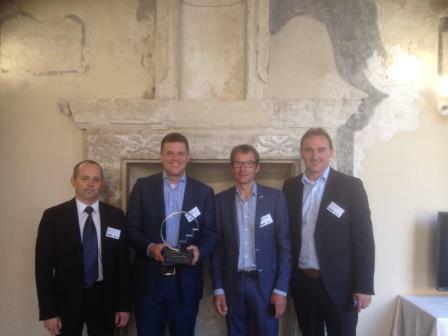 The proud winners of the IWA-KWR Award (fltr): Sven-Roger Kahl (Ardagh Glass), Olaf van der Kolk (Reststoffenunie), Jan Peter van de Hoek (Waternet) en Ludwig Cammaert (Desso).